Larry's Opinion Drive-thru: Reflections on the "See-through Cycle"
Professional Cluster Group #5 focused on reflections. I took the opportunity to focus on my experience at the "Challenge Based Learning Group Think", sharing what I had gleaned about the "future of the book" and the student as "free agent." Participants filled out the "Big Idea" Survey that I blogged about which I recently blogged. This shall serve as grist for our next session on "Deep Learning." Finally, in small groups we discussed our experience with the "See-through Cycle which surpassed my greatest expectations in terms of participation. The reports on the experience were universally positive, but the big question concerned how to take transparency to the next level. I'm really looking forward to ratcheting up the discussions with some exercises I have planned for "deep learning." Stay tuned! 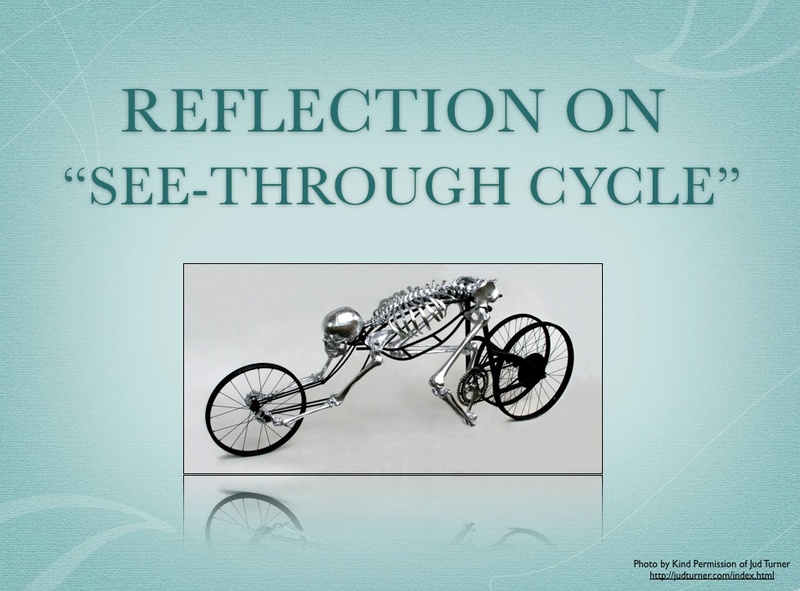 "See-through Cycle" title slide photo insert thanks to the kindness of Jud Turner.